Are you dreaming of your loved one far away? 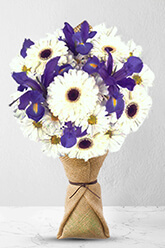 They will love this Dreamy bouquet of creamy Gerberas and bright coloured Iris. Remind your loved ones of your existence today.Lilies may be sent closed/partially closed in order to prevent damage and to last longerVase not included however; to add to the element of surprise, zFlowers.com recommends including a Premium Vase with your order. The flowers were nice. It would have been better if I could choose the colours. Initially I was concerned because the courier couldn't deliver to the apartment, with nowhere to leave the flowers, and I didn't hear about that until they were back at the depot. If I'd had a call directly from the courier or at the time, I might have been able to get access information for them. This was Saturday afternoon and I was worried they wouldn't get them till Monday. But thank you very much for organising delivery on a Sunday - that was unexpected and very pleasing. Very happy with your prompt service! Thank you! Advice on the phone re the 30% discount was very helpful, plus same day delivery was appreciated.